I'm sure a decent portion of you out there wish you could have wizard duels like they do in Harry Potter. Two opponents, wands in hand, look to cast spells at their opponents in order to knock them out of the fight. Well, up until now, you really couldn't do that in real life. 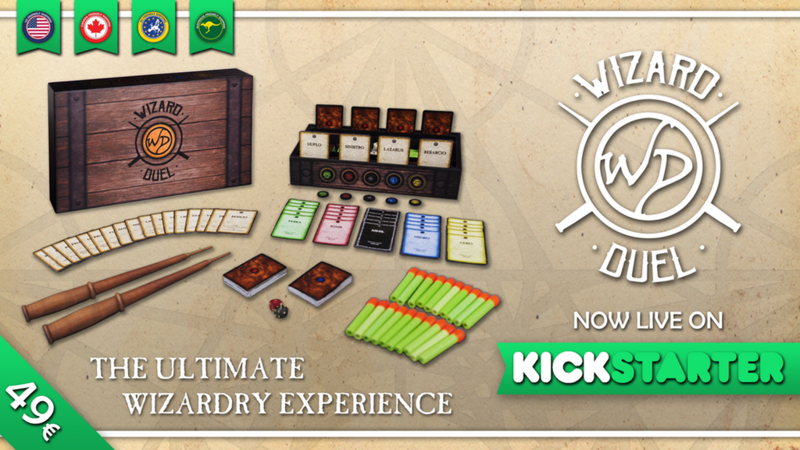 Wizard Duel, a new game up on Kickstarter, looks to change all that by using actual wands (ok, so not actual magic wands, but still, actual wooden wands). The Duel develops through dynamic combat rounds, following four simple steps. Draw scrolls from your deck until you fill your side slots (four scrolls in total), grab spell charges and go to your starting spot. When both duelist are on guard, at the count of three, combat begins. Use your Duel Wand to throw the spell charges to your rival and hit him before he does. Choose a spell from your hand pronouncing it out loud to make the following throws valid; you can change your current spell this way whenever you want. In case of impact, the last spell pronounced will apply. Any impact on the body or clothes of your rival is considered a hit. Impacts on the Duel Wand or the hand wielding it are considered blocked. You can harvest spell charges freely. A hit must be announced out loud (with a “hit” or a simple “argh!”) and ends the combat. If a hit duelist has a spell already charged on his Wand at the moment of the impact, he has the right to a last-chance throw. Duelists who got a valid hit announce the effect of the spell to their rival. In case of double hit, each duelist suffers the effect of the correspondent spell. In case a seal has been destroyed, remove it from its frame and put it into the chest. Each duelist discards two scrolls to the discard pile besides his deck. Any valid hit spell must be one of the discarded scrolls; otherwise, duelist chooses both discarded scrolls. The round is over. The first duelist to destroy all rival’s elemental seals wins the duel. The campaign is up and running now. It's set to go for another 27 days.